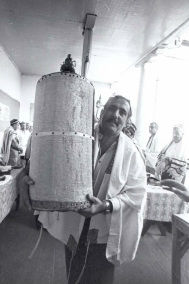 Jews across the world are connected to one another through the religious tradition they hold in common and through a shared sense of peoplehood. Yet, over the past two millennia, Jewish peoples have also been shaped by their diaspora experiences. Scattered across the globe, their diverse histories and environments have given rise to a variety of Jewish religious, cultural and social forms. This course employs the anthropological lens to focus on Jewish far-flung communities including those in Europe, North Africa, Central Asia, and East Asia. As we “visit” these regions over the course of the semester, we will encounter a wide range of colorful Jewish cultural practices and social expressions: a Passover seder in India, a wedding in the Saharan Desert, a Jewish community center in Denmark, a Jewish school in the United States, and a mourning ceremony in Uzbekistan – among others. While the descriptions we will read – provided by anthropologists, journalists, travelers and historians – are fascinating and provocative, our purpose is not to study Jewish practice in catalogue form. Moving beyond the descriptive, we will analyze the ways in which these cultural and social forms are linked to the particular social and historical circumstances in which Jews find themselves. We will examine the ways in which they serve as vehicles through which Jews remember their past, navigate social boundaries between themselves and their non Jewish neighbors, define their identity, create community, and find meaning in religious ritual. By the end of the semester, we will find that the differences between the Jewish forms we have encountered are so great, we have to contend with the question: What then is Jewish? Has the diaspora experience given rise to such variety that the terms “Jewish people” and “normative Judaism” have lost all relevancy? Or are they still meaningful categories, and if so, how are they maintained?